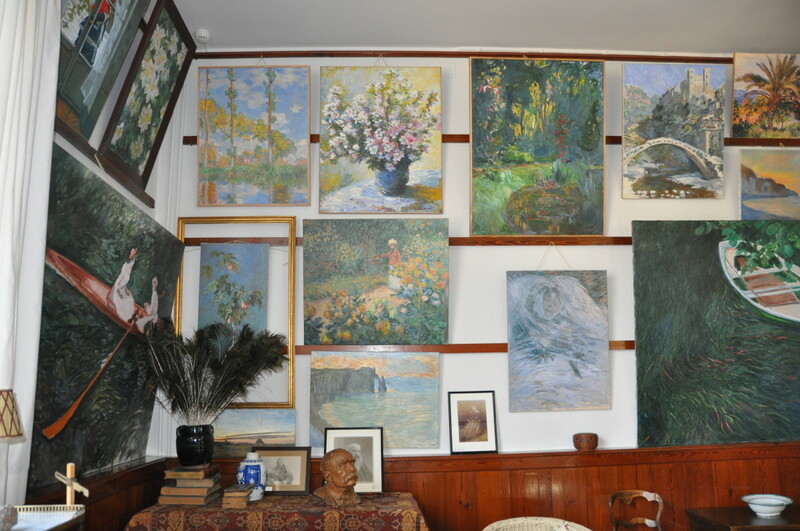 Sixty replicas, that is to say very good copies, have just been hung on the walls of Monet’s first studio at Giverny, making the place even more atmospheric. Untill last year, visitors could see prints on canvas on the walls. The new copies are now real paintings on canvas. They were made by a French gallery, galerie Trubetskoy in Paris. The chosen pictures were all in Monet’s own collection of his own work in his late years. These were the paintings he loved most and didn’t want to sell. In addition, all the details of the studio have been checked on old photographs to be as accurate as possible. The result is stunning and really moving. 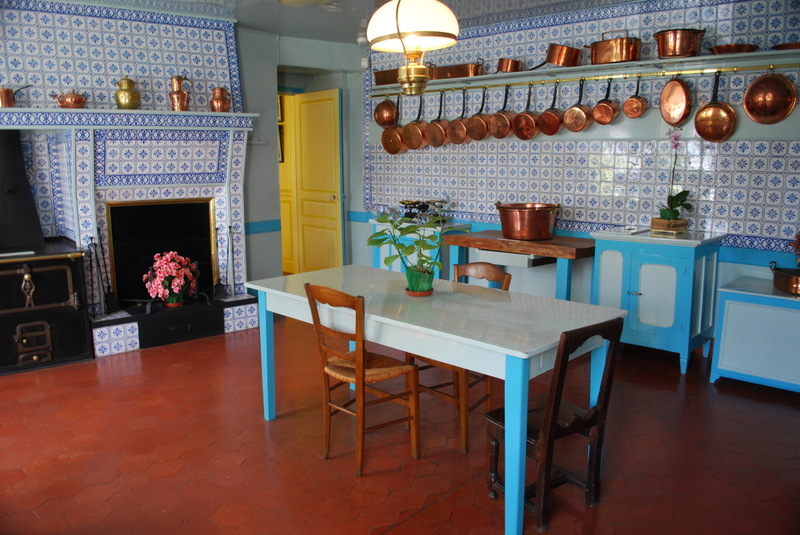 Very striking in Claude Monet’s kitchen at Giverny are the blue tiles that cover all the walls. My German friend Veronika Stark painted this view of Monet’s garden under the snow. It has been white for almost two weeks lately, but now the snow has gone. I wish you all a wonderful celebration of New year’s Eve and a peaceful 2011. 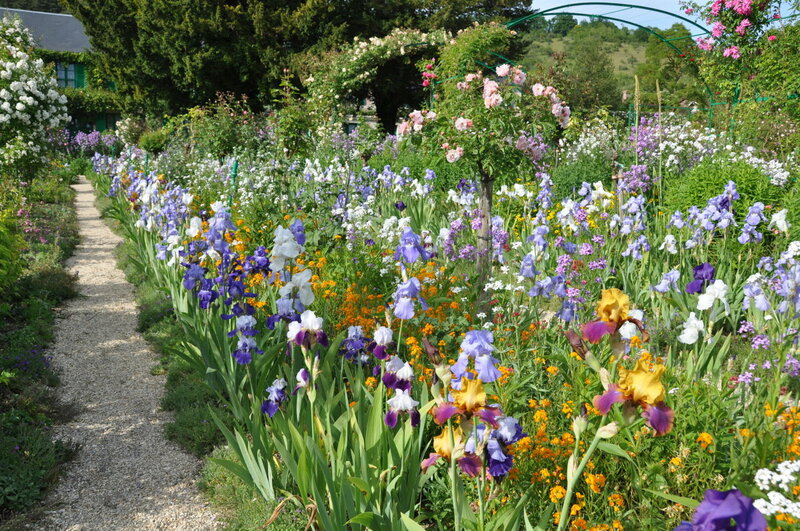 Hope to see you at Giverny! 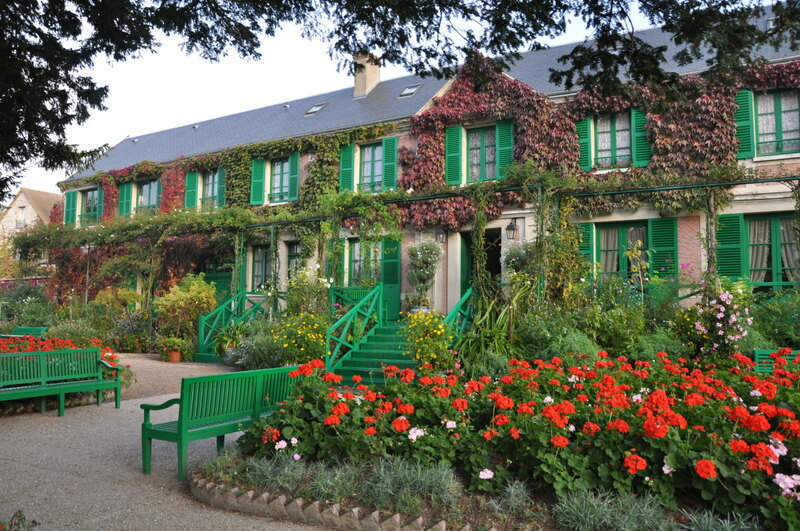 Today was the last day of the season at Giverny. At 6.00pm, the flags at the entrance gate were taken in for the last time of the year and the last visitor left. The shutters of Monet’s home will stay closed tomorrow, while the gardeners will start their rush before frost. They have to store fragile plants in the greenhouses, and pull out all the flowers to clean the beds and start thinking of next spring. 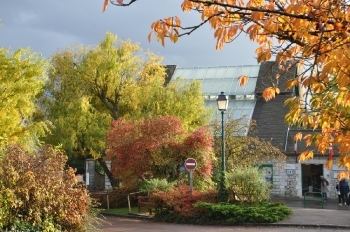 Fall and winter are a busy time for the gardeners! Giverny lies west of Paris, 80 km away from the city, in the Seine valley. 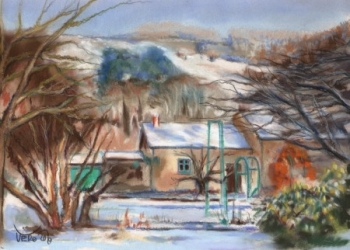 The river flows at the bottom of the hill on the background of the picture. It has carved deeply the tender chalk of the plateau, creating steep hills. The bottom of the valley is floodable, this is why the village was built at the foot of the hill. 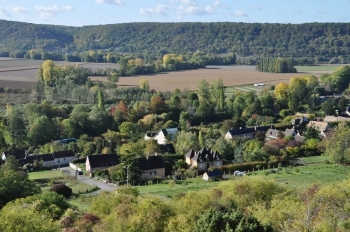 It stretches over three kilometers along a single street, now named after Claude Monet. Right in the middle, you can see the big studio of Monet, recognizable thanks to the window panes on the roof. 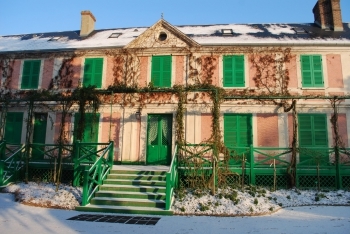 On its right, the long pink house with a slated roof is Monet’s home. 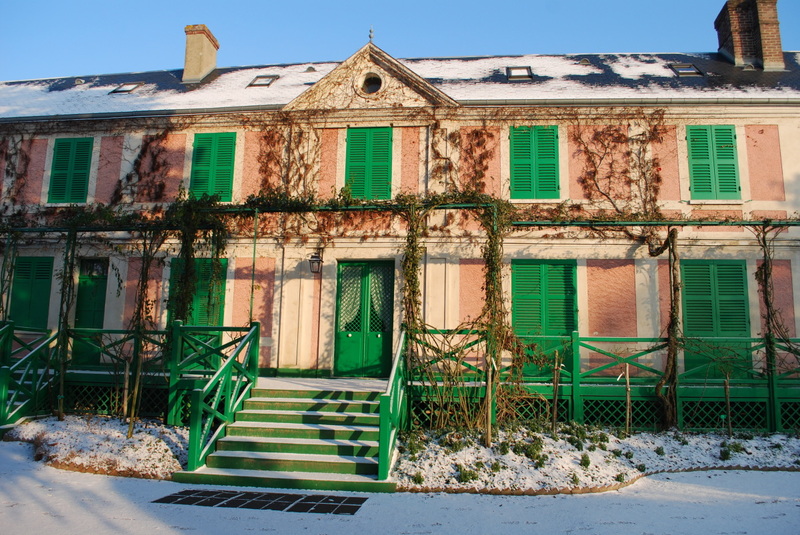 And on the right of the house, the next building was Monet’s second studio (see the windows on the roof there too). Behind these three buildings one can notice the garden. The trees on the pond side blend into the nature around, hardly noticeable by their more vibrant colors. 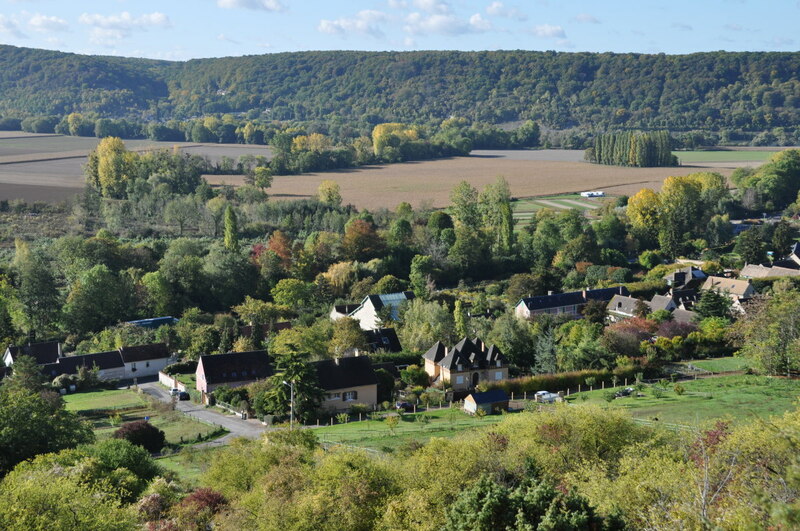 And behind Monet’s gardens, fields show that there are good alluvial grounds here. 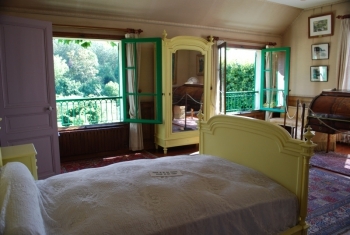 Nesting in its natural surroundings, Giverny is a rural village in the countryside, living on a slower pace than the big city of Paris. Being a nice day out is one of the assets of an excursion to the home of Claude Monet. 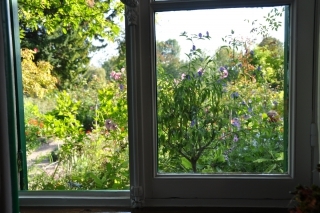 During the Winter, when Giverny is closed for five months, the shutters of Monet’s house remain shut. It must be dark inside, but nobody cares. 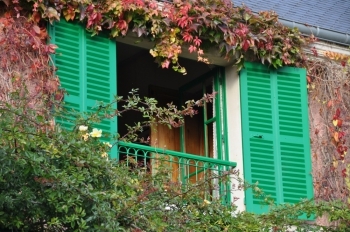 The shutters prevent the cold wind from entering the building, maintaining a thin layer of warmer air behind the windows. I don’t know if the japanese prints are still kept hanging on the walls. If they are, darkness is a relief for their fragile colors. Shut shutters look like closed lids. 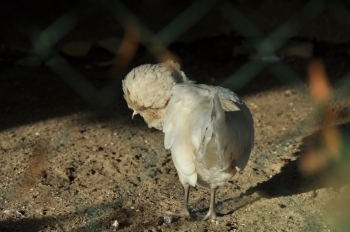 When it is cold outside, sleeping is the best thing to do, isn’t it? So do the bulbs hidden in the flower beds and the buds on the branches. Yes, sleeping is the best option before a very long time of intense activity. Monet’s gardens at Giverny will soon close: next Sunday in the evening, on November 1st. Just before their Winter sleep, they offer a gorgeous show on the side of the water garden. The tall trees that surround the pond change their green or dark red colors for much brighter ones. 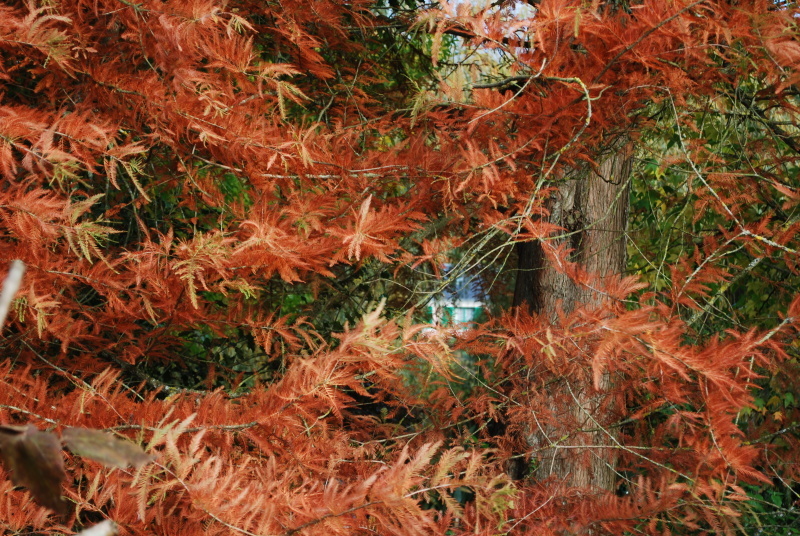 The taxodium becomes as red as a squirrel. It will last a few days and then it will loose its needles, until new ones grow next Spring, giving it a fresh green look. 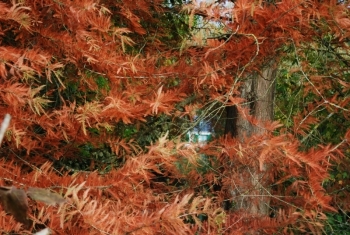 Through the branches of the taxodium, like a spying eye, one can spot a window of Monet’s house in the distance. 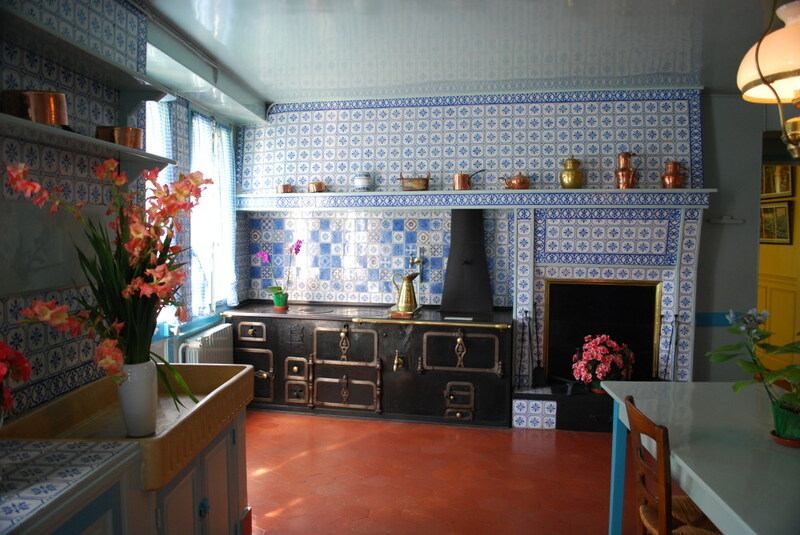 I have just been given the right to take pictures inside of Monet’s House. I am thrilled being able to comment on this very special home I love! Taking photographs in the museum is forbidden for several reasons, especially because of the very fragile japanese woodblocks that hang on the walls. 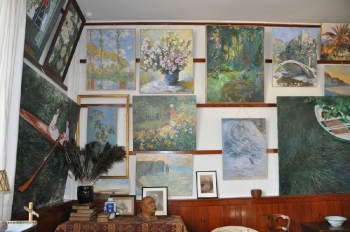 Monet didn’t want his own work to decorate his home: it was work! He preferred something more exotic and fun. He would hang them everywhere except in his studio, in the kitchen and in his bedroom. 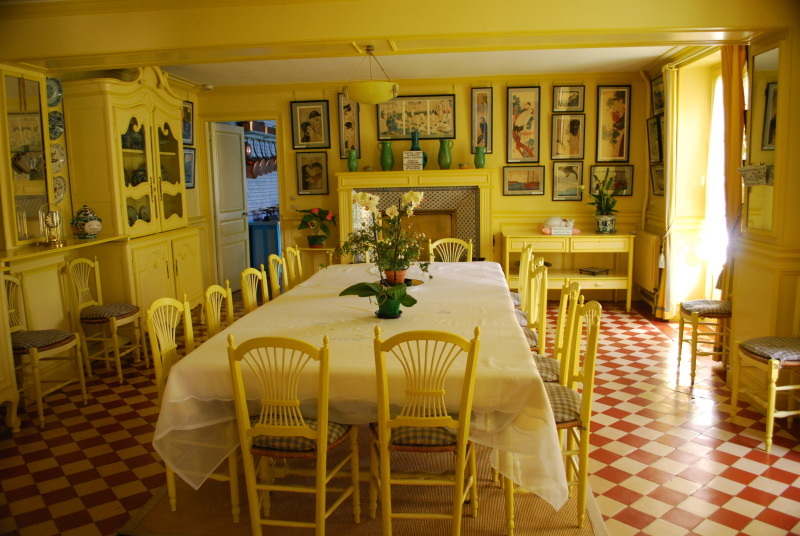 I don’t know what strikes visitors most when they enter the most beautiful room of the house, the famous dining room. The Japanese prints cover the walls, almost masking them, their mainly blue color matching the yellow furniture, walls and moldings. It is strangely modern, especially when compared with the very heavy and dark fashion in matter of decoration in Victorian times. Bright, and stunning. Everybody says waow! 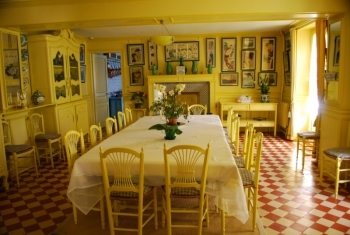 when stepping inside of this yellow dining room, and most people like it. But for some visitors, it is too yellow.